Summer Concert Series Lineup Announced! 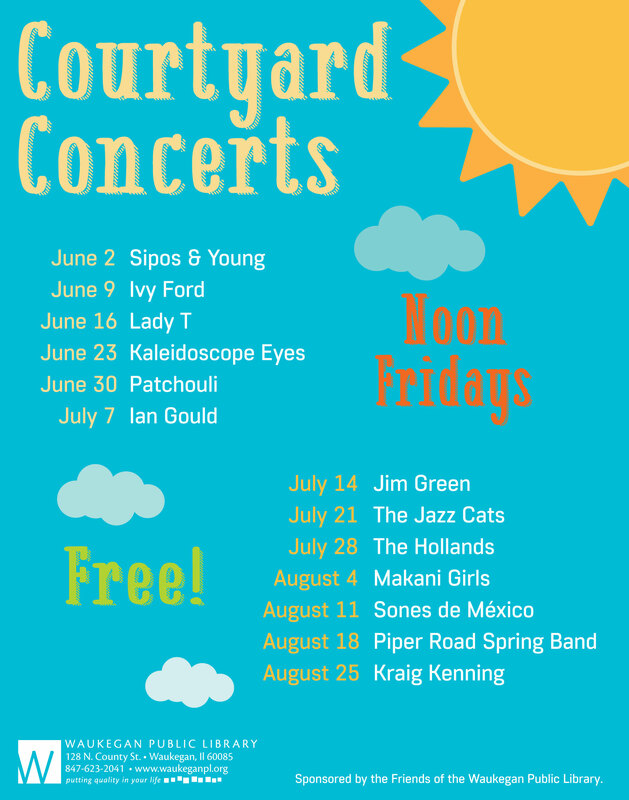 Waukegan Public Library is excited to announce the lineup for its annual summer concert series! Concerts are held every Friday in June, July, and August, from noon until one p.m. in the Library’s front courtyard. In the event of rain, concerts move indoors to the Bradbury Room on the lower level. This year’s concert lineup represents a wide variety of musical styles and genres. Some old favorites return, while we bring a number of groups to Waukegan for the first time! The centerpiece of this year’s series is a musical tour of Mexico with award-winning Sones de México Ensemble, on August 11. Other highlights include music of the Beatles from Kaleidoscope Eyes in June, returning favorites The Jazz Cats and The Hollands in July, and Hawaiian music and dance from Makani Girls in August. Dockside Dogs will be returning to grill hot lunches for concertgoers, with menu and pricing to come on the Library’s website at www.waukeganpl.org. Patrons will be able to purchase their lunches from Dockside Dogs right at the concert. Sweet treats and drinks will be available for purchase from the Friends of the Library, who offer cookies, brownies, and more at each concert. The Library’s summer concert series is generously sponsored by the Friends of the Waukegan Public Library. The Friends of the Library raise funds throughout the year through their book sale, available every day the Library is open along the south wall; two major book sale events in the fall and spring; and with sweet treats sold during the concerts, as well as through gifts from members. The Friends of the Library also support numerous other events throughout the year, including the Library’s signature Storytelling Festival each October.